With the April 2019 release wave of Microsoft Dynamics 365 now entering the market, Business Central partners begin to focus on the October 2019 release, which will bring the end of support for the product's older development model and user interface. Starting with the October 2019 release, Business Central will support only the modern client and will only allow for development of customizations and solutions in AL through VS Code. At the partner-focused Directions ASIA conference, partners and Microsoft examined some of these changes, including the benefits of retiring the Windows client and embracing improvements being made to the modern client in the areas of productivity and performance. Also, as seen in the photo above, Microsoft Technical Fellow Mike Ehrenberg presented to the partner audience in Kuala Lumpur. His role has been characterized by multiple sources in the last month as the interim or temporary engineering lead for Business Central, but in slides photographed at the event he was also described as "GM". It is generally believed that Microsoft is still searching for a general manager to serve in the R&D leadership role last held by Marko Perisic, though Microsoft has not confirmed it. Writing on the Business Central partner blog, group program manager Claus Busk Andersen clarified that the product's future is focused user experience through "our modern web and mobile clients, and our embedded Outlook add-in". 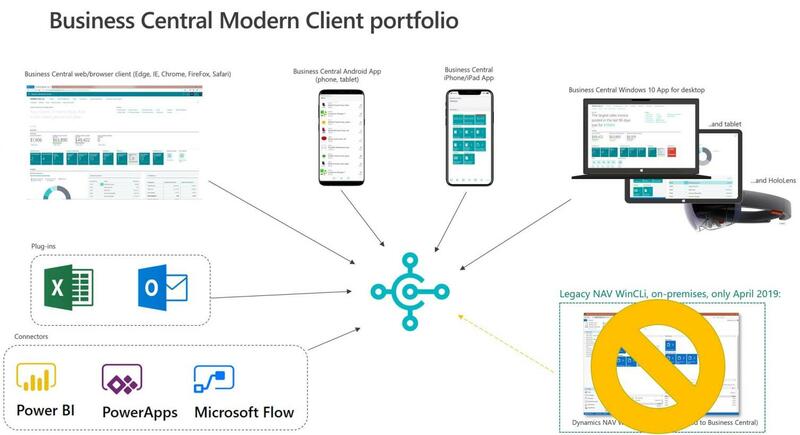 As seen in the top graphic, the modern client portfolio includes the primary web-based interface for multiple browser, mobile apps for Android and iPhone/iPad, a Windows 10 App for desktop, plugins for Excel and Outlook, and Power Platform connectors. With the October 2019 update, we will move to Visual Studio Code and ship our application as AL. We are investing to add features to our Visual Studio Code development experience to make it more productive for developers compared to the C/SIDE environment that it will replace. The April 2019 update contains the last on-premises version with the C/SIDE development environment, and includes the last distribution of Business Central as C/AL code. Combined with the native capabilities of Visual Studio Code and the connection to other modern development tools, these changes will accelerate innovation in the product and across the ecosystem. Beyond April 2019, the Business Central roadmap also transitions to focus on three key areas, as seen in the roadmap screenshot captured at this week's partner event: proficiency improvement, "CDS, data, and intelligence", and an expanded localization footprint. As a partner event, content shared out of the Directions ASIA event trended heavily toward the solution development and customization interests of VARs and ISVs. Kasper Tomshoj of PrintVis noted on Twitter that ISVs still need better visibility on the CSP delivery model and on managing product delivery for new and existing Business Central users. Two great ISV related takeaways from the Q&A session at #DirectionsASIA Complications of a through-partner model on CSP is on the radar - stay tuned in 2-3 months. There is a growth and extremely low churn rate for the Business Central in the Cloud, but how about the on-premise customized solutions? – This question was asked lots of times during Directions ASIA 2019 and still the answer is Extensions. Microsoft MVP Eric Wauters noted several development-related changes (among other updates) coming to the October 2019 release in his own blog post from afar, including forced sync of extensions to prevent breaking changes, better error details, dependency pruning for the in-client designer, code actions, and more. There’s no more time to wait I think, start re-architecturing your solutions and start embracing the new development experience for Dynamics 365 Business Central as soon as possible. I believe your statement "will only allow for development of customizations and solutions in AL through VS Code using Extensions" is misleading. Forced use of extensions is only for cloud, correct?